I wanted to read this book from the very first day I discovered it (publication day in the US) but alas my little library did not yet have a copy so I had to impatiently wait; first for it to appear on the virtual shelves and then for it to make its way through the five people who had reserved it before me. My instant reaction on finally getting my hands on this book and reading it - It was so worth the wait! 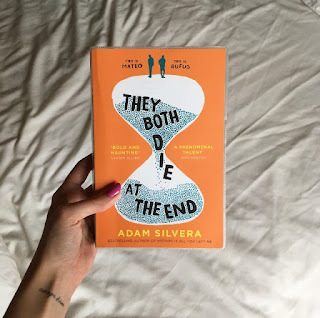 There was a constant flow of tears for the last twenty pages and I'm not sure if my heart will ever recover from the bashing this book gave it but wow is it a good story and I was so absorbed into the world that when my phone started to ring half way through reading I genuinely had a split second where I thought "this is it, my last day." Thankfully it was only my dad but that momentary panic backs up just how good I found this book. The general concept of Death Cast telling people when their last day is (one minor question though: who exactly is applying for that job?? are you okay?) and all the Last Day creations like making moments and finding a last friend through an app is just so scarily cool to me. I love it and it definitely flung up some questions like "what would I do on my last day" - and honestly I don't know. Each boy had their own very distinctive voice though which was great as they were easily identifiable from each other; their individual ways of speaking coming across in their thougts as well as in their speech. R & M became friends before anything else; it was definitely a strangers to friends to lovers story that stopped off at each section - despite the 'one day' situation it didn't feel rushed at all. We saw each of the main boys interacting with their friends - at tines I thought we wouldn't see them very much but I loved that this was a book that did focus on friendships as well as everything else it covers. Just how many side characters voices we heard from; some were important to the plot but a couple of others I just found jarring. The idea that Mateo had to become this new version of himself. Yes it made for a better story but at times it did read as if being a quiet, more reserved person is a bad thing - and anyone who is like that has this inner wild child just waiting to be released. Some people are quiet all the way through- like a stick of rock. Adam's world captured me completely from only a few chapters in; the writing is wonderfully descriptive without being over the top & apart from a few niggly bits I did really enjoy this book. Have you read TBDATE yet? What did you think of it - let me know below or over in the comments on my latest instagram post!